Concerns are growing over North Korea’s pursuit of a submarine-launched ballistic missile, which, if fully developed, could pose a serious security threat that may not be countered by the current capabilities of the South Korea-U.S. alliance. Various reports and intelligence based on satellite imagery have suggested that the North has been testing launching systems on ground-based facilities to apparently mount them on submarines or naval vessels. Experts expressed doubts about the North’s submarine capability, saying that the North had yet to reach the technological level to mount ballistic missiles on its submarines. But they said the SLBM in the hands of the unpredictable regime would be of grave concern. “In terms of the size of its submarines and its technological level, I believe the North can hardly be able to build an SLBM at the moment. 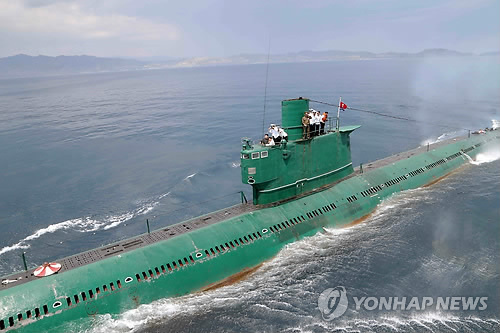 But it is true that there has been a series of signs that the North has been attempting to develop an SLBM,” a source told The Korea Herald, declining to be identified. Fears about the SLBM stem from the North’s potential “second-strike capability” to launch an overwhelming nuclear retaliation if it suffers a first strike from enemy forces. The second-strike capability forms the basis of a condition referred to as “mutual assured destruction” that maintained the “balance of terror” during the Cold War era. Submarine-launched ballistic missiles are at the core of the capability as submarines can launch targeted stealthy attacks on enemy forces. Nuclear experts also consider strategic bombers, intercontinental ballistic missiles and SLBMs to be the strategic components of a “nuclear triad” needed to ensure a nation’s nuclear deterrence ― a reason why major military powers have struggled to acquire the three weapons systems. During the Cold War, the nuclear weapons served to maintain a “long peace” based on the rational thinking that one nuclear power would not stage a nuclear war with the other side as the war would mean an irrevocable catastrophe for both sides. But when it comes to the unpredictable regime, it would be difficult to expect it to carry the same rationale, observers pointed out. “At a critical time in a war, one can use the SLBM to wreak havoc on the enemy forces or even civilian targets ― a reason why the SLBM has served as a powerful nuclear deterrent. But that is when each side thinks rationally,” said a security expert, declining to be identified. The U.S., South Korea’s security ally, has offered “extended deterrence” ― Washington’s commitment to protecting its ally with its nuclear and conventional assets against threats from nuclear arms and other weapons of mass destruction. But the deterrence commitment focused mostly on dealing with ground-based targets, experts noted, raising the need for the allies to come up with effective ways to counter the possible SLBM threat from the North.